Miso Crafty Knits: Starteritis...To the Max!! I don't know what it is, but for some reason I felt utterly compelled to knit gauge swatch after gauge swatch and then start project after project over the span of the past few weeks and a bit. I'm blaming it on Spring. Y'know, it being a new season...the season of fresh starts and new beginnings. So yeah, I totally blame it on Spring. Normally when I get a bout of Starteritis I usually start up 3 or 4 new projects, but this time around I started up 7 new projects!! Yes, definitely project overload! Of the 7 projects, 4 of them are sweaters, 1 is a pair of socks, 1 is a mask, and 1 is a top. 5 of the projects are for me, while the other 2 are for gifts. You would think that 7 new projects on the needles would curb my need for something new and exciting, and yet I'm still itching to start a toque and some cowls - even though we're totally in the wrong season for them. I think I need to either give up sleep so that I can knit all these projects that I want now, or learn how to knit continental style in hopes of upping my knitting speed. I think the latter is probably the better choice. On top of the knitting projects I had also warped up my loom last week and had cut out a sewing project. I have a self-imposed deadline for the weaving project, but have no idea when I'll get around to that sewing one since I'm still in a "war" of sorts with the evil neighbour downstairs. My poor sewing machine probably feels so lonely and neglected! Anyways, the photo at the top of this post is one of the WIPs as a result from this round of Starteritis. 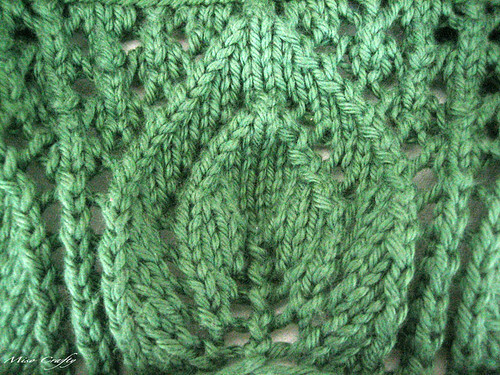 No matter how many times I tried, I can't capture the beautiful color of the green that yarn really is and I'm way too tired to try to Photoshop the crap out of it to get it to the right color. But trust me when I say that it's actually a gorgeous deep, yet vibrant shade of green that is reminiscent of jalapeno peppers. The photo above is one of the projects to be gifted. The deadline for that one is for the end of the month. I was all gung-ho about working on it, then all of a sudden that momentum came to a halt and has been put on the backburner for quite some time now. 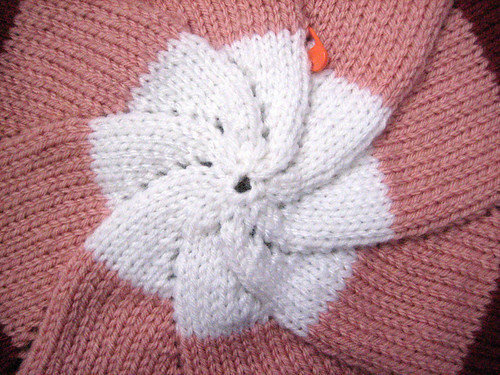 I should really get a move on it before the end of the month arrives and I'm caught completely off-guard and stuck knitting into the wee hours of the morning the day I'm suppose to give this project away. I can totally see that happening. So with that said, I should get a knit on! 'Til next time, Happy Knitting Blogging Friends!